Some projects turn out exactly the way I want them to and make me smile. Other projects turn out better than I even expected and make me super happy. And then there are those projects every once in awhile that turn out SO freakin’ cool that it makes me giggle-like-a-little-school-girl excited, and this is one of them! 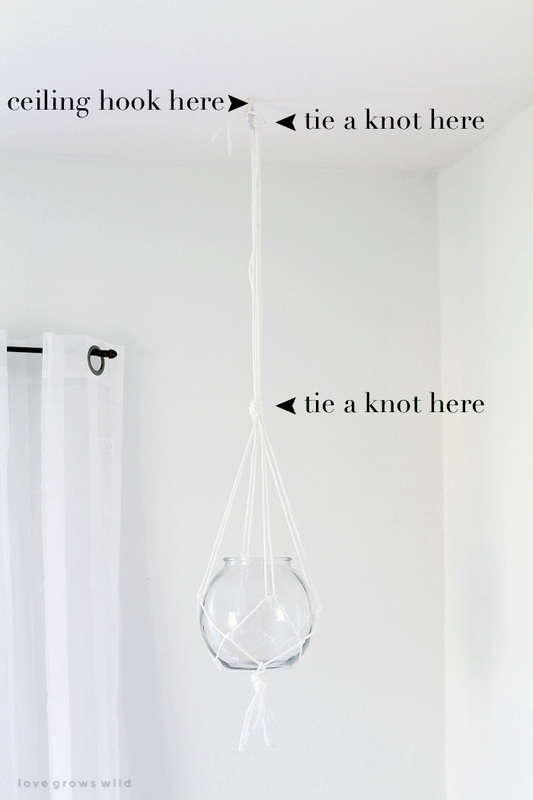 I hung a fish bowl from the ceiling of my office in a gorgeous DIY macrame hanger! 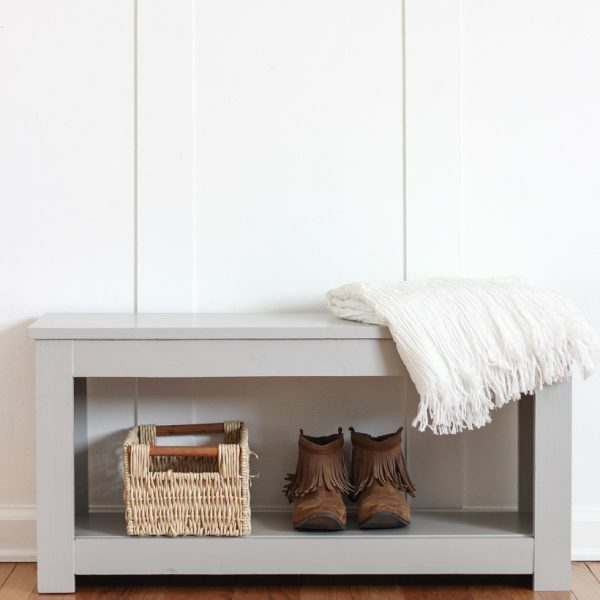 The inspiration for this project came from a hanging planter tutorial from my blog crush, A Beautiful Mess. They used plastic fish bowls and chain to suspend some adorable planters from the ceiling, and I knew I had to have them in my office. Fish bowls… how genius! 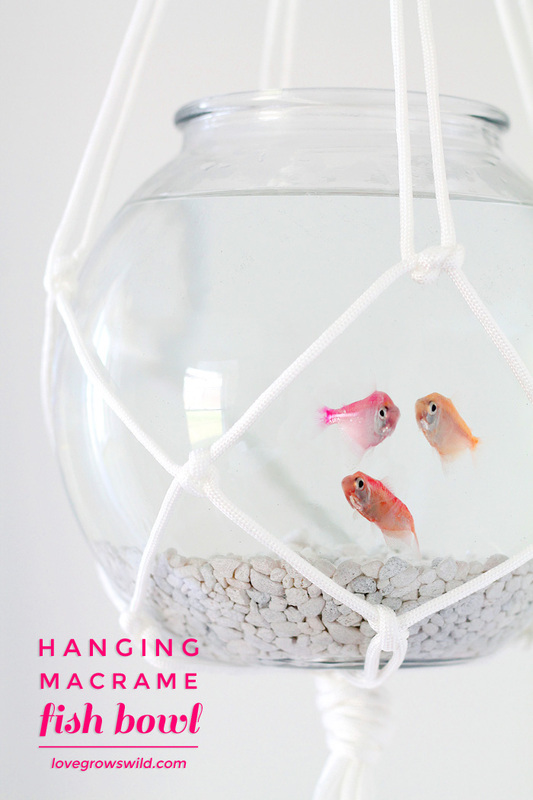 It took awhile to figure out the logistics of how I would safely hang the fish bowl from the ceiling, and in the end I settled on an easy DIY macrame hanger, which happens to be very on-trend right now anyway. It’s funny how things from the past always come back in style, huh? 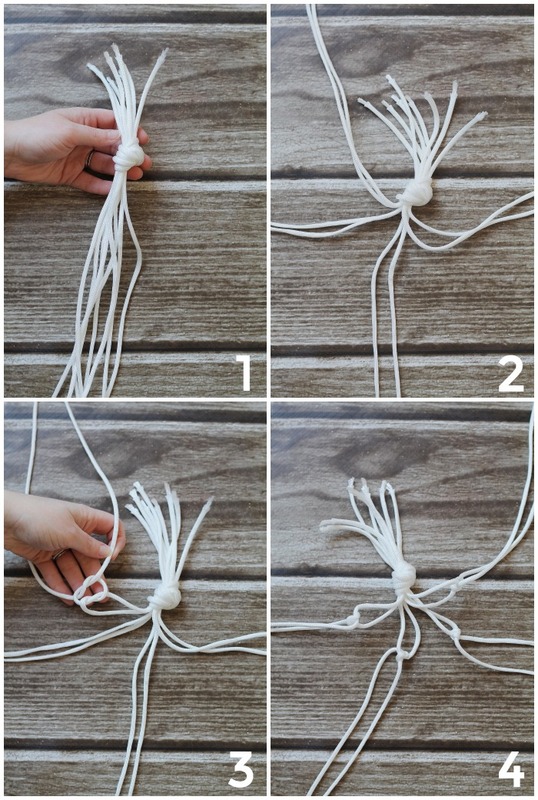 Macrame is nothing more than tying a bunch of knots together, and I promise this project is SUPER simple to do. I’ve included plenty of pictures so you know exactly where and what to knot, but if you have any questions at all, just leave a comment below! * Ignore the round metal piece in the picture above… I didn’t end up using it! Cut eight pieces of cord that are each 5 feet long. Gather all eight pieces of cord and tie a large knot at one end, leaving 1″ – 2″ loose at the top. Separate the cord into four sections, with two pieces of cord in each section. Take one section and tie the two pieces of cord into a double knot, leaving a 2″ gap between the first large knot you tied. Repeat with the remaining three sections of rope. 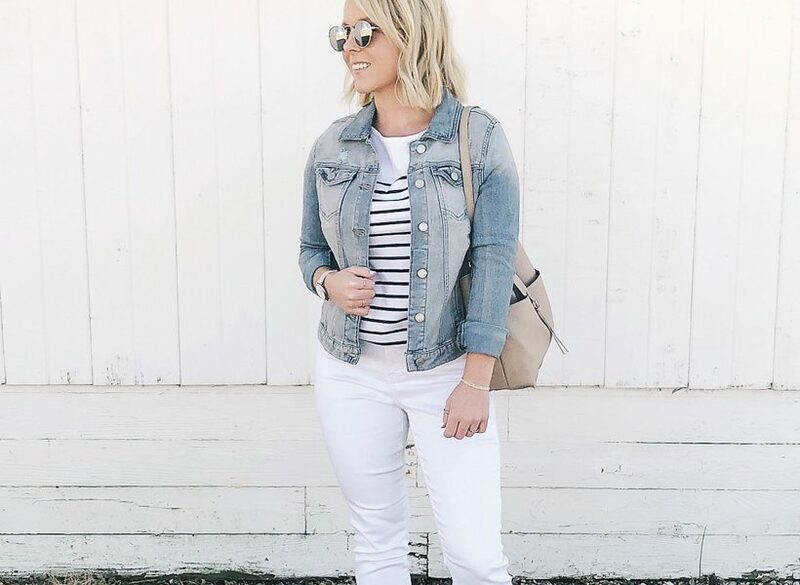 Take one piece of cord from a section and combine it with a piece of cord from a neighboring section by tying a double knot 2″ away from the previous knots you tied. Repeat this process for the remaining sections, using one piece of cord from two different sections. Now repeat steps 5 and 6. 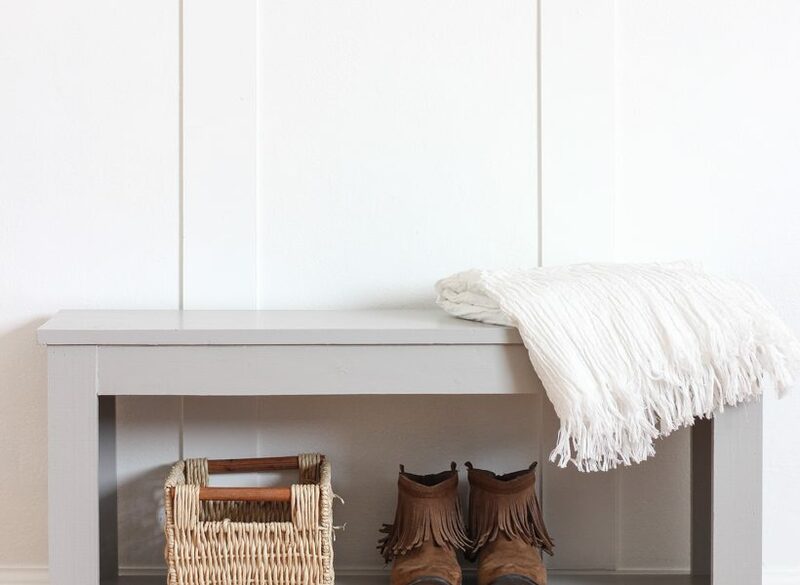 Take one piece of cord from a section and combine it with a piece of cord from a neighboring section by tying a double knot 2″ away from the previous knots you tied. Repeat this process for the remaining sections. 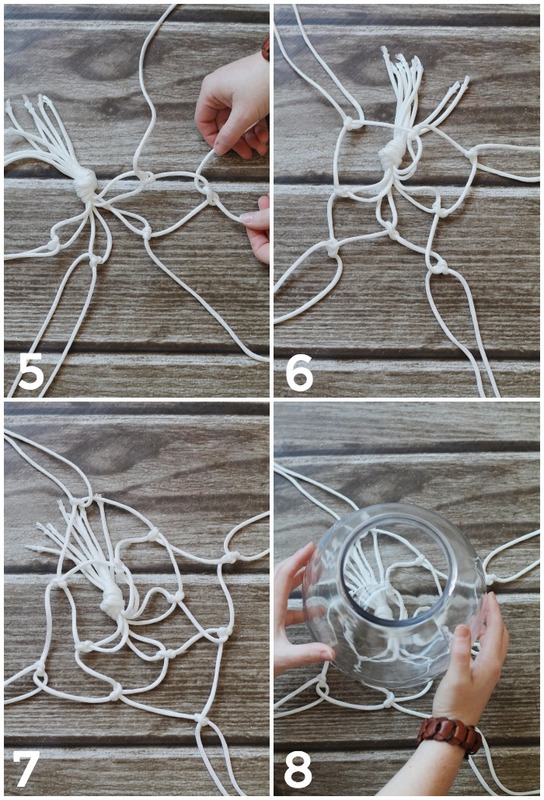 Place your fish bowl on top of the knotted cords, centered on the original large knot you tied. 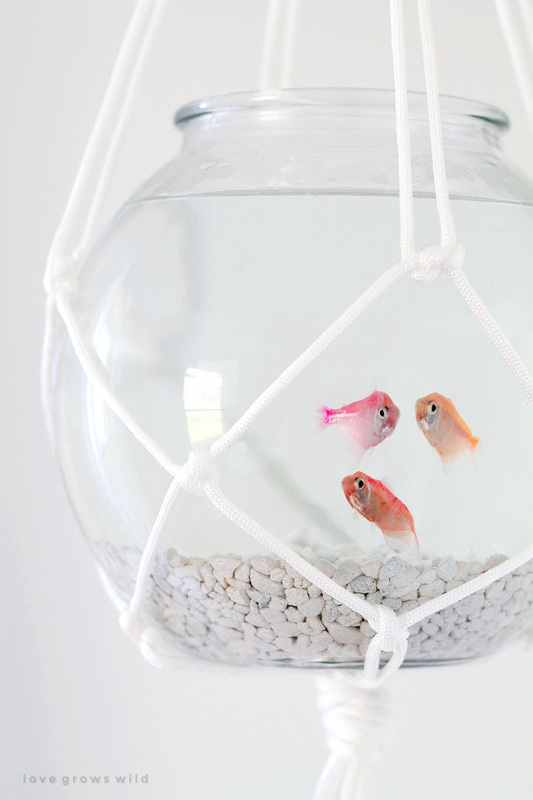 Pull the loose ends of cord up around the fish bowl. The bowl should safely rest in the knotted area. 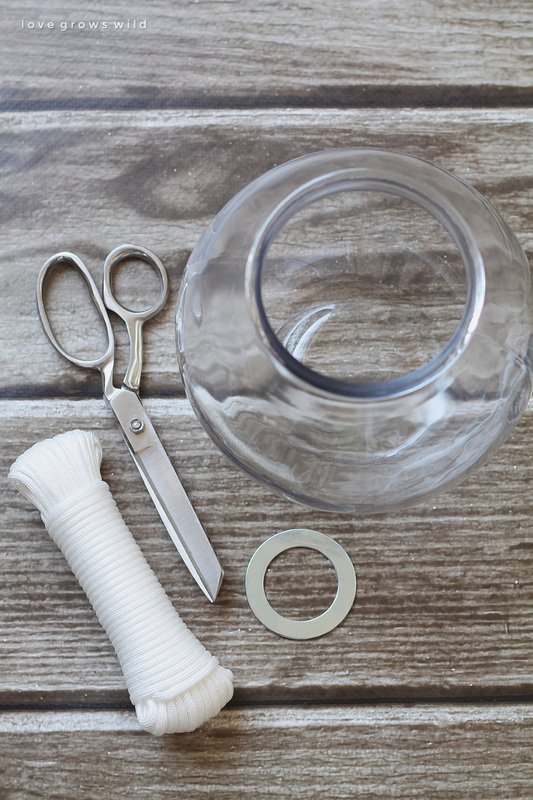 Tie a knot combing all eight pieces again about 10″ – 12″ above the top of the fish bowl. Just make sure you leave enough space to pull the bowl in and out for cleaning. Tie another knot at the very end of the loose cords and pull it as tight as you can. Add a ceiling hook where you want the fish bowl to hang. Slide the hook underneath the top knot, in between the eight pieces of cord. 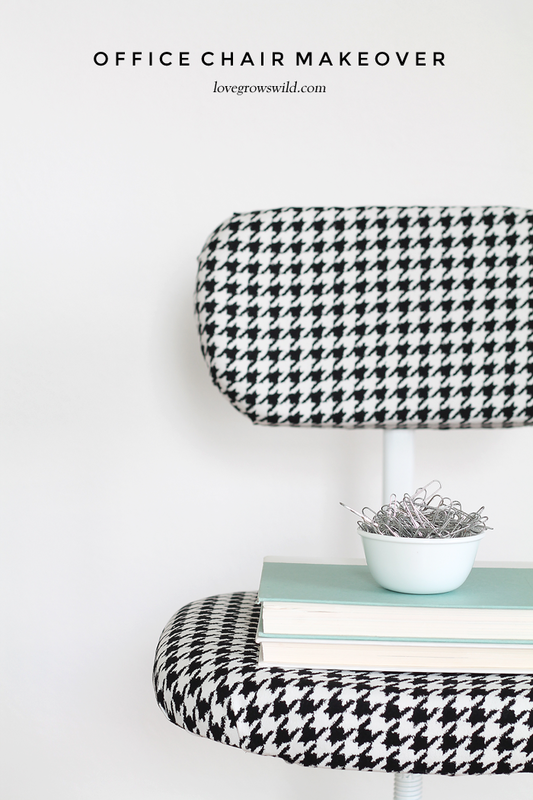 Make sure four pieces of cord are on either side of the hook to hold the hanger in place. Add your fish and enjoy! 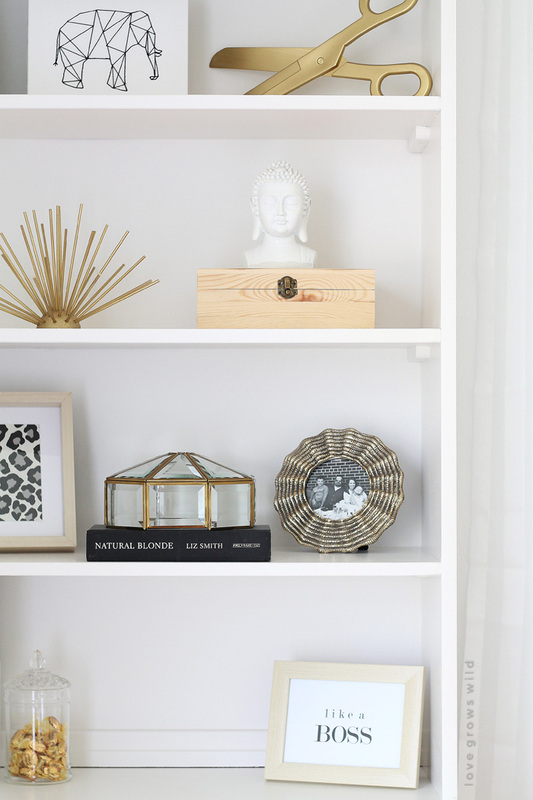 You’ve heard that adding plants to a room will bring life to your space, right? Well these adorable, little fishies do the exact same thing and their bright colors just make me smile every time I walk by. I knew I didn’t have the table space to set a fish bowl in here, but suspending it from the ceiling is a big space saver and, let’s face it… it looks super cool, too! I gave the hanger and ceiling hook a pretty good tug before adding the fish bowl full of water just to make sure I wouldn’t have a total disaster on my hands. I’m happy to report that it was VERY safe and sound! My boys are older now, but I think this would have been an awesome solution when they were little and wanted to play IN the fish tank every time I turned my back. I’ll be sharing what is sitting BELOW my new fish friends sometime in the next few weeks. Just a few more odds and ends to finish up first! I couldn’t wait for Alec and Wyatt to get home from their grandparents’ house this weekend so I could show them the new additions to our family. Do you think they bought it? I don’t know, but we’re all loving our new fish friends anyway! So, tell me what YOU think! 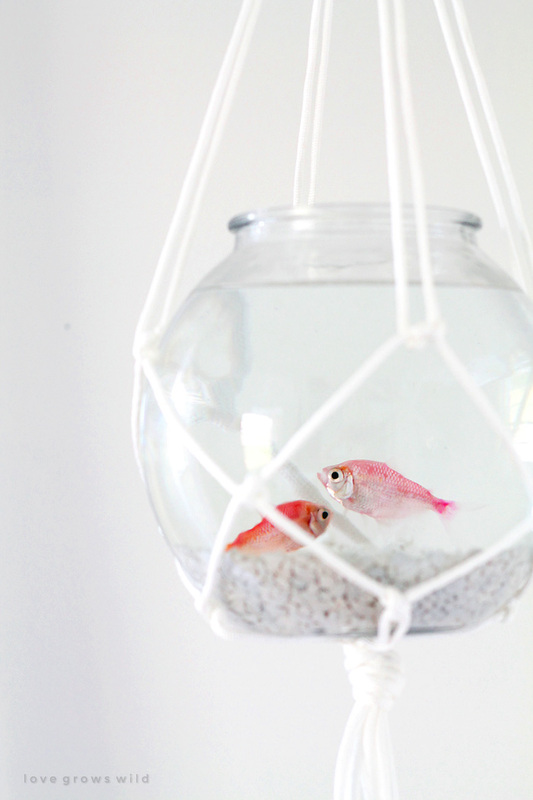 Is the idea of a hanging fish bowl totally crazy or totally awesome? Do you have any fish at home? I’d love to hear your thoughts! Oh this is so cute!! 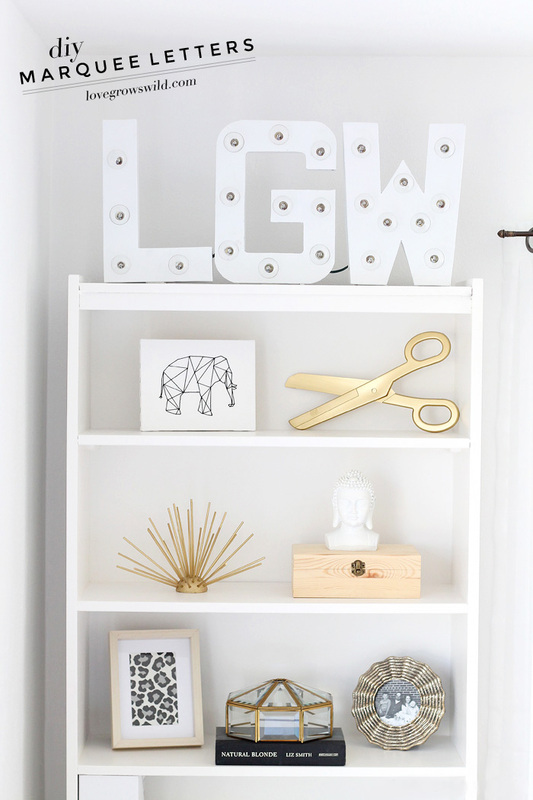 I’ve loved all the things you’ve shared from your office, you are so incredibly creative! What a beautiful space! Such a sweet memory! Thank you for sharing, Heather!! I’ll take crazy wonderful from you any day! 🙂 Thank you so much for stopping by, Lucy! This is the greatest idea ever. I’ll be sharing on my FB page!! Did you ever consider that your little “experiment” is doing cruelty to animals?? People with such an simple-hearted attitude really scare me. But as long as you have something for your embarrassing “DIY”-“live for shallow-brained people”-Blog i guess thats fine for you. Maybe next time you an “report” on shooting african elephants for some silly decoration-issues?! Regardless of fish being intelligent or having feelings, they’re still in a much too small of tank. It sounds like you have dead fish often because you don’t realize just how much upkeep they are; in this case, I, too, feel bad for the fish. I like your creative thinking however; this is NOT a suitable home for goldfish. For starters, it is too small, they NEED waterplants and a little pump for extra oxygen in the water. Did you know goldfish could live up to fourty years when housed right? Thank you for the tips, Ilse! These fish are actually tetra fish, not goldfish, so we’re still learning what will be best for them. Thanks for stopping by! FYI, the requirements for all fish are the same, no matter the species. And though this is pretty from a design perspective and seems easy to care, this is not a good way to keep live animals, sorry. That is, in order of importance: no oxygen in the water, no filtration of noxious waste, chemical additives in the water, no shelter, no space, (and if this setup is anywhere near a window) algae will be inevitable. Probably your previous failures were due to this setup. To maintain it you will need to change the water very frequently and this is at the least disruptive and at the worst fatal (very hard to control water quality in such a small volume of water, overdoing or under-applying chemicals to condition the water is tricky business)… Now that I’ve warned you the tetras may very well live for a ‘long’ time in this setup, but you should consider it animal cruelty nonetheless. If you want to keep the bowl, I would empty it so that the water level is at the widest point, and exchange your tetras for a single betta. Fish bowls can work for bettas (fighting fish) for short periods of time as their mouths are adapted to breathing at the surface, but either way these are very poor living conditions. Sadly, the aquarium store where you bought the fish in the first place should have told you all this, to avoid this situation in the first place. It’s so sad cause these are living creatures, not to mention your kids will get attached and it can be emotional when they die… Fish bowls shouldn’t be sold at all in my opinion, but they do make lovely terrariums : ) maybe consider that approach instead? If you switch to a Beta, note that they commit suicide with open lid bowls. Rules of fish: 1 fish to every 5-10 gallons of water unless under an inch. For every inch over 1, add 5 gallons more. 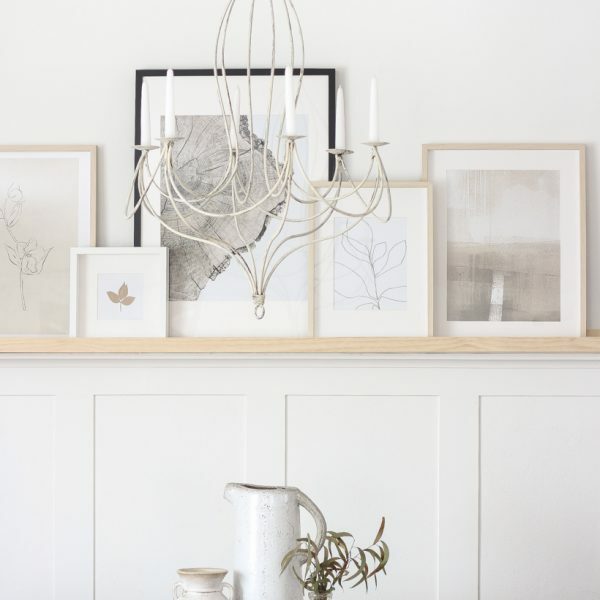 Macrame is definitely back! 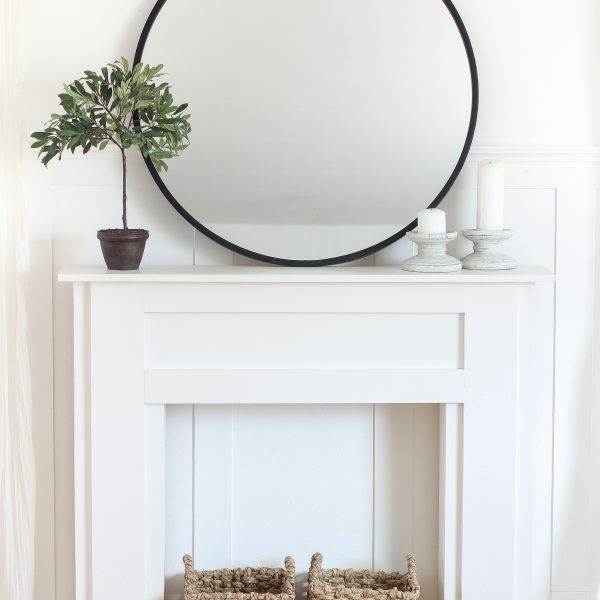 I can remember having macrame plant hangers in our living room and bathroom growing up, and I love having this in my house now too. And yes, if I had things my way, the fish would clean their bowl themselves, but since I don’t see that happening anytime soon, I looks to be my job! It’s well worth it though to have such a cheerful addition to my office. 🙂 Thanks for stopping by, Pamela! This is so whimsical and fun. 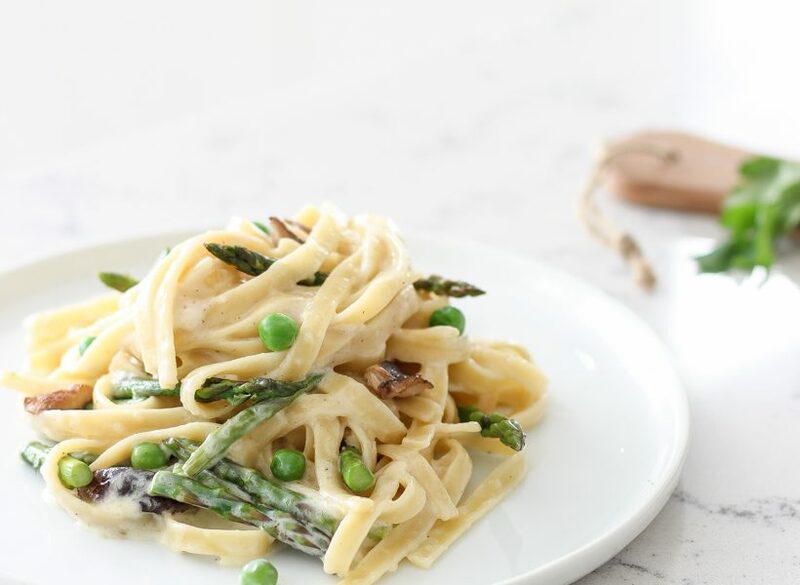 You are brave to try it, but it turned out great!! Thank you, Val! I’m a crazy risk-taker… what can I say? Lol 🙂 So glad you could stop by and check it out! I am sharing this on my FB TOO! Thank you, Yasmina!! I tested it VERY well before putting that fish up there! Wouldn’t want a swimming pool in my office. 😉 Thanks so much for stopping by! Love this! It’s a very fun way to house fish, and will look very cool in your office. However, I think it would just end up being a very messy cat toy at my house… Could be interesting! I’m sure they’d love it! Thank you, Katie!! You’re the best! I love this idea, Liz! Just love it! Such a small tank should be very easy to maintain, I’m sure they are getting lots of TLC from you. What a sweet memory of your grandmother! Mine was always working on plastic canvas or embroidery projects. I have a ton of things she made! And yes, my sweet little fishies are quite loved. 🙂 Thanks for stopping by, Lyuba! 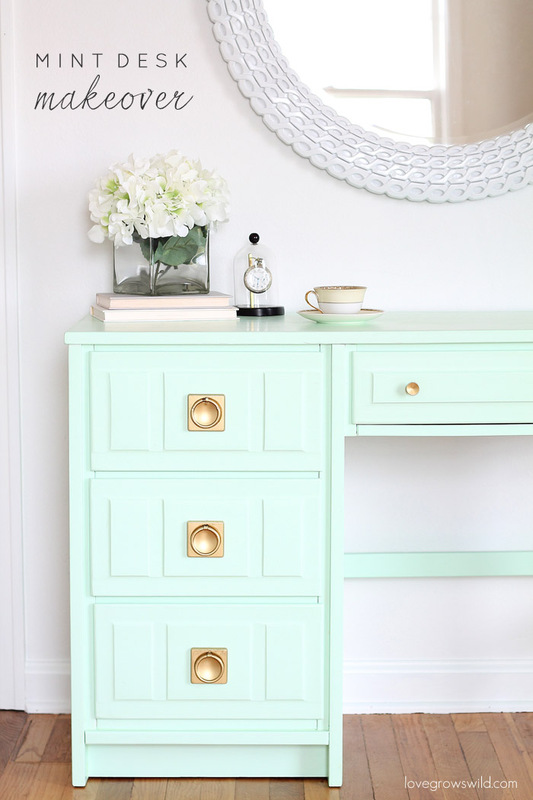 Wow – I absolutely adore this!! I don’t know much about tetras, but I’m sure beta (fighting) fish would do just fine in this type of environment. Love your blog! Thank you, Katie!! I’m so glad you could stop by and check it out! NO they would not! Shame on you for thinking this is ok to keep ANY fish in! Bettas are tropical fish that need heaters and filters. Pets are not decor for your entertainment. This is cruel and shouldn’t be considered a fashion statement. If you are concerned about table space, don’t get a fish! You’re teaching your kids that pets are just a thing and are for your entertainment and don’t require care. 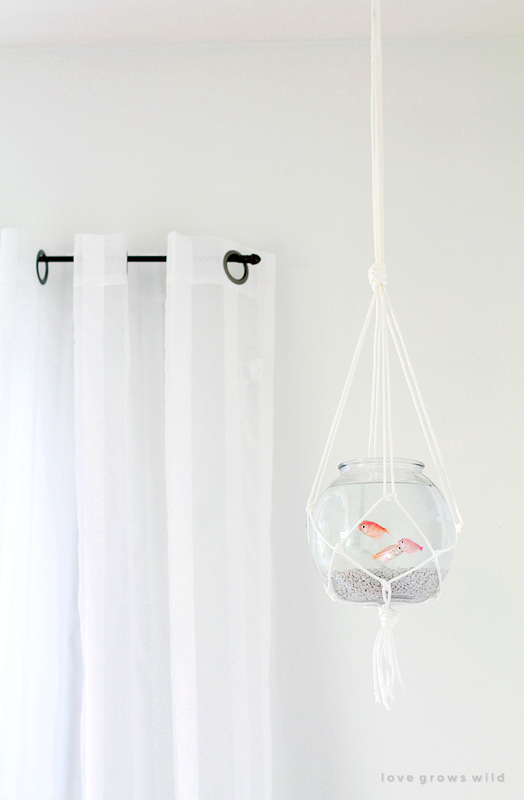 I like your blog and I like the hanging bowl idea, I just don’t think this is a suitable living environment for fish. You are giving them no stimulation whatsoever. Can you imagine being kept in a cage and having nothing to do 24/7? They need some kind of plants or little structures to hide in. And I really don’t know how you’re going to change the water once a week, when it’s hanging from the ceiling. I think you should have stuck to the hanging plant idea. I like the macrame idea but seeing people use fish for decoration makes me really sad and uncomfortable. I really hope you rethink this. Such a pretty idea. I love it and the fish look so pretty. Thanks for the inspiration! This was pinned on Pinterest and makes me sad that it’s circulating so much. Love the macrome, hate the cruelty. Swap out the died/painted tetras for an airplant – and get a gigantic tank for your office so your fish can school and have even more impact on your office. Manza, Italy banned this practice of fish in bowls because of the cruelty. I don’t mean to be intruding on your project and I don’t think you deserve all of the backlash you are getting, its an honest mistake. But thank you for this idea! 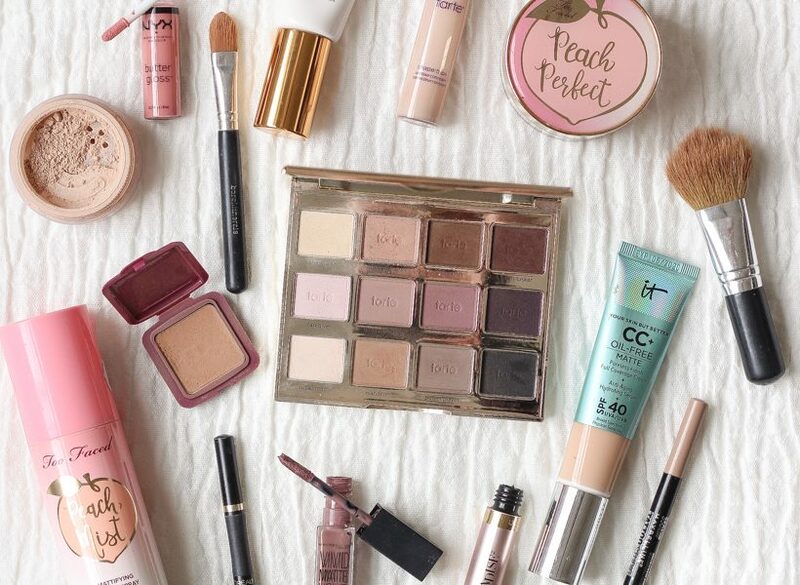 I plan to try it out very soon and I’m really excited! Welcome to Love Grows Wild, Stacy! I am thrilled to have you here! I just used a basic ceiling hook from the hardware store and drilled a small hole into the ceiling to get the hook started, then twisted it into place. It’s held up beautifully so far! 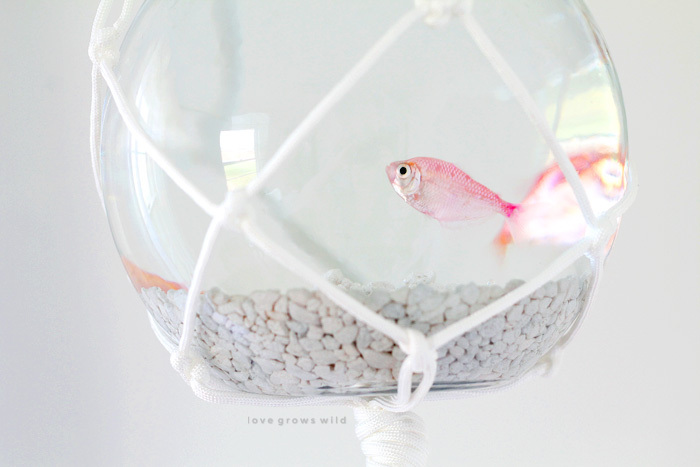 Love the hanging fish bowl tutorial! What type of fish do you have inside the bowl? The fish are beautiful what kind are they? what size diameter nylon chord did you use? … I can’t remember!! It was a pretty standard size. Maybe 1/8″? Sorry I can’t be more help! this is a great idea and I would love to try it but, is it close enough to the ground that you can take it down to clean and feed the fish? Looks great to me, and I don’t see the cruelty here. I think some people just have tight knots in their undies.. Or they wanted u to leave the fish in the pet store to die along with all the other thousands.. Crazy people today, always finding the negative. 😂 Smh.. Next time I’d leave out the animals. Keep yourself in the clear from the crazy hippies! But great job, I love it! I seen one on TV where they had a shelf hanging from the ceiling then the bowl on top but I thought too much weight.. So this is the perfect idea I needed, thank you! I think your previous attempt at fish keeping was unsuccessful because the bioload was way too high for the space you had. I’m not going to say “Eviiilllll bowls are animal cruellllltyyyy!! !” but three fish is definitely too many for that small bowl, especially considering that you don’t have anything to filter the water with. I think your best bet is a single guppy. A guppy makes a good choice because it’s pretty, it’s hardy, it’s tiny, it has a very small bioload, and it doesn’t need a heater unlike a betta. As an illustration of a guppy’s hardiness: I too have a guppy in a tiny plastic tank of 1.8 liters right now. It was sick and listless, and it was hiding behind the filter, so I isolated it. Amazingly, the guppy is now quite active and seems to be recovering. To help improve the water quality of such a small body of water, you’ll need water plants, low light ones preferably, because you won’t have a growing light to help them grow. Plants that I have experience with and can recommend are anubias nana and creeping jenny, but there are other low light plants. Since your fish is in a bowl, I can also recommend using a spiderplant; place only the roots in the water and keep the foliage out of the water as if that bowl were a vase; your plant will love it and your fish will also be thankful. Otherwise, I think your hanging bowl is quite creative! Good luck with the fish keeping and make sure to feed them very little for the sake of water quality. Oh, I forgot to say this in my previous comment, but you should consider tossing 1 or 2 aquarium snails into your bowl. They are usually considered pests in an average aquarium, because they breed like crazy and get stuck in the filter, but in your set up they are an asset that will help clean up any debris and leftover food that your fish can’t get to, so they help to keep the water clean. Remember that fish keeping is all about water quality, and water quality is all about bioload. How many animals can I put in a given body of water without the water becoming dirty/toxic with waste? If you balance your ecosystem well enough, you won’t even have to do water changes. I haven’t changed the water for my sick guppy in weeks, I only add water that’s been evaporated.